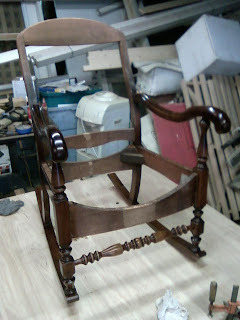 Here are some pictures of two chairs I have been working on. 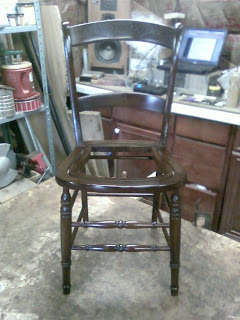 The first is a Victorian side chair. 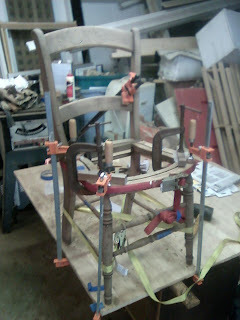 In the first photo you can see the chair glued and sanded. 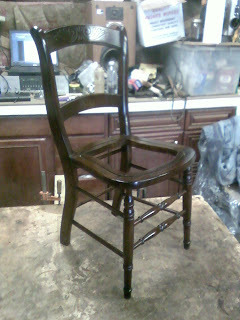 The next three photos are of the chair after it had been french polished. 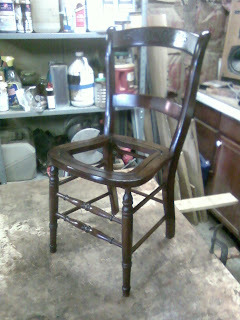 After discussing the chair with the customer, we decided to stain the chair brown. 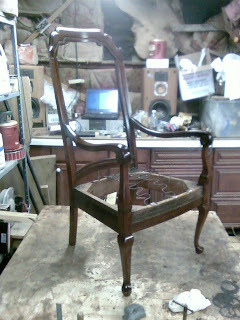 The last three photos are of the mahogany arm chair after being french polished. 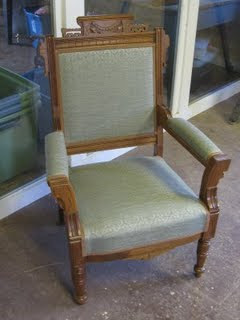 When the caning and upholstering is complete I will post more photos. 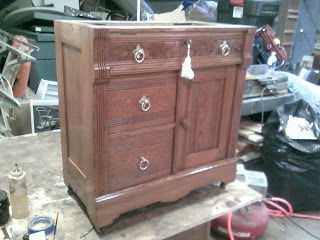 Here are some photos of the wash stand I have been workng on with the finish restored and the hardware polished. 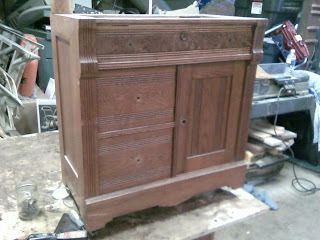 As I mentioned in a previous post, the marble top for the washstand was left at the customers house. 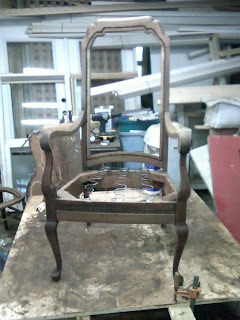 Here is a picture of the piece with it's hardware removed. 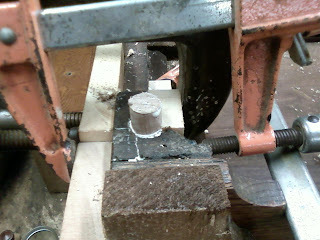 The top of the piece is marble which I left at the customer's house. 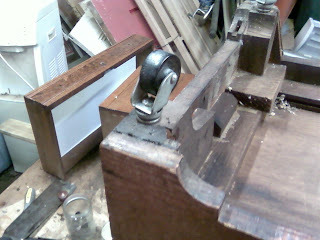 The main issue with the piece was that the front right caster was loose because the blocking had broken. 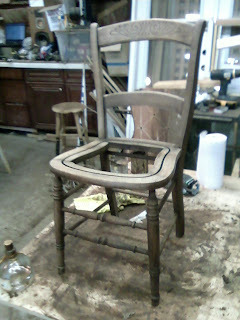 The first step in repairing this was to replace the blocking with new wood. 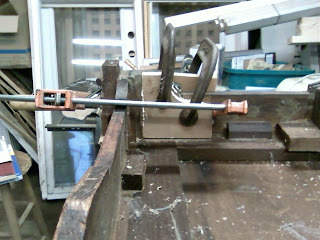 This is seen in the photo below: Once the blocking was glued in place the a dowel was inserted to plug the hole for the caster. 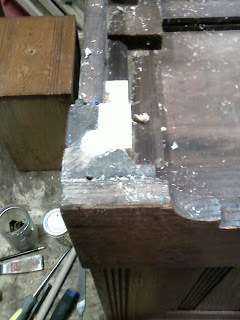 After the glue dried the dowel was trimmed flush. 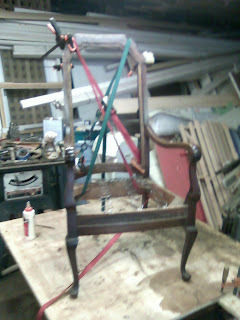 Here is a picture of the caster in place and all of the blocking stained to match the existing blocking. 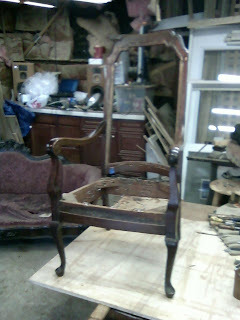 Below are some photos of the three upholstered pieces I am working on with the finish work completed. 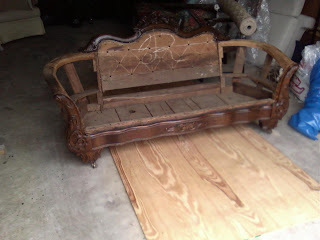 In the case of the Sofa, the natural color of the Walnut came out several shades lighter than the original finish. 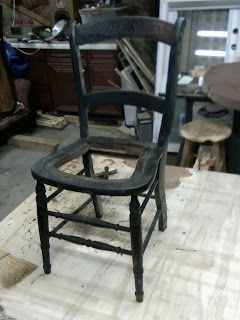 As finishes age, they collect dirt and wax etc. which makes them appear dark. 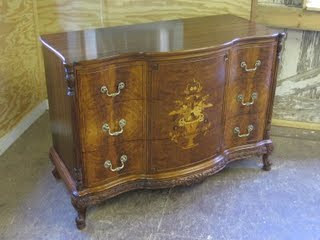 It is also possible that this piece had been stained at one point. 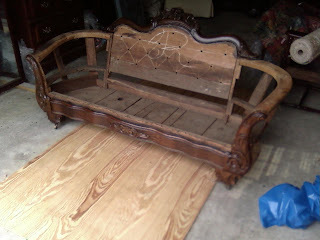 The new finish shows off the natural color of the wood as well as the repeated crotch veneer along the base of the sofa. There are two pictures below. 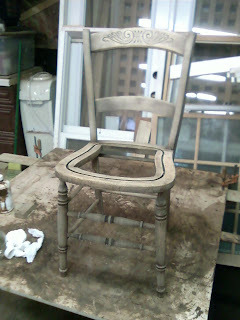 The natural color of the arm chair was inconsistent so I stained it to match the darkest part of the chair. 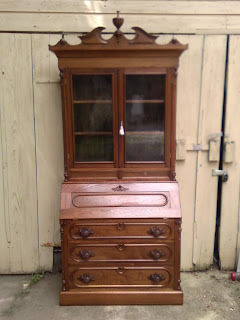 If you look at the earlier photos the piece appears lighter. 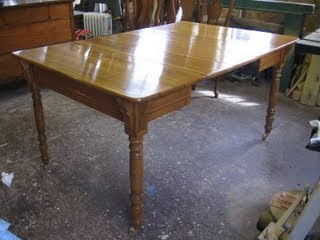 This is a result of the existing finish, a varnish of some sort, yellowing over time. 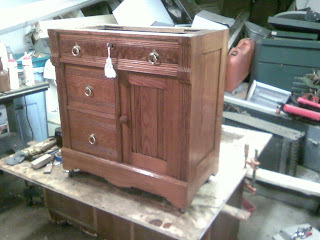 The result was that the finish gave the piece a yellow/light brown coloring. 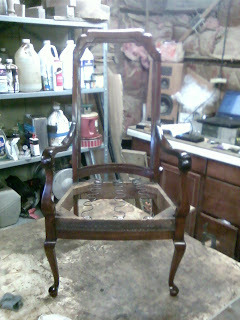 When the finish was removed the natural colors came out. 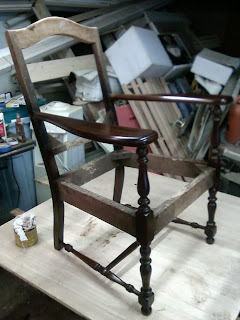 The rocker has a restored original finish, with the exception of the arms, which I refinished. 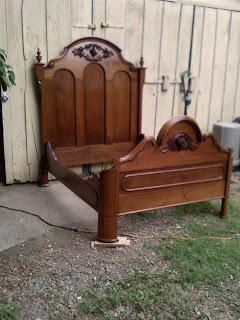 I will post photos of the pieces completed when they com back from the upholsterer. 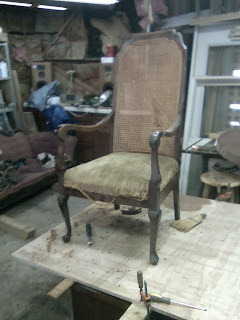 The chair with the caning and upholstery removed. 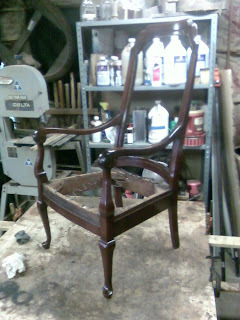 The top section of the back had been poorly repaired in the past and the joinery had loosened again. 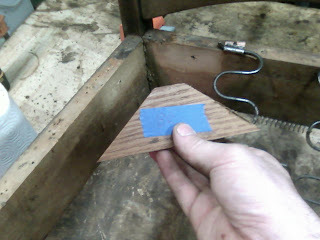 this is a picture of re-attaching the back. 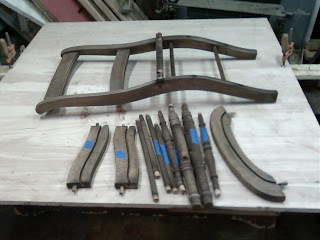 The Chair was then disassembled and the joints were cleaned for gluing. 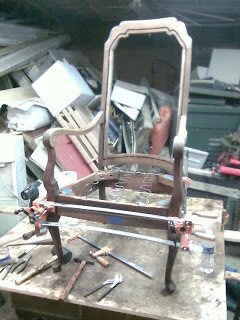 The chair being glued. 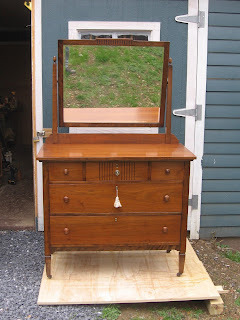 I thought it would be a nice idea to create a post devoted to some pieces I have completed with links to the pages concerning their restoration. 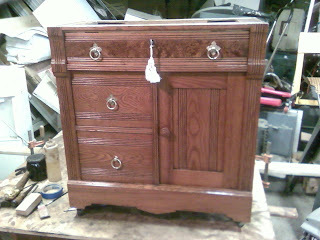 As new pieces are completed I will post them to the blog.